NATS Executive Director Allen Henderson and NATS President-elect Karen Brunssen returned from two weeks in China as invited lecturers and clinicians for two festivals with the International Federation for Choral Music. NATS Executive Director Allen Henderson and NATS President-elect Karen Brunssen returned from two weeks in China as invited lecturers and clinicians for two festivals with the International Federation for Choral Music (IFCM). 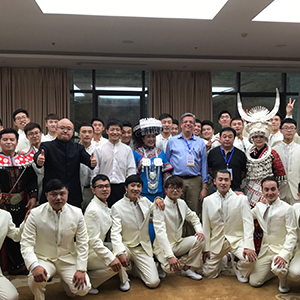 They spent the first week in Kaili, China for the 2017 China (Qiandongnan) International Folk Song Choral Festival and the IFCM World Voices Conference, and the second in Hohhot, Inner Mongolia for the 14th China – Inner Mongolia Grassland Festival “Sounds From the Silk Road”, Chorus Nadam of International Federation for Choral Music. Leadership, invited lecturers, coaching experts, and invited choirs came from China, the United States, France, Italy, Sweden, Thailand, Hungary, Mexico, Norway, Morocco, Portugal, Mongolia, Hong Kong, and Russia. These choirs ranged in size from three voices, four voices, six voices, 12 voices, 16 voices, up to 60 voices. During the first week over 40 Chinese choirs participated in mini-choral workshops following performances for coaching experts Jonathan Miller, (artisitic director of Chicago a cappella and artrisitic director of Encore Illinois), Beverly Shangkuan-Cheng (President of the Philippine Choral Directors Association), Allen Henderson, and Karen Brunssen. Choirs ranged in size from 30 to 80 singers, and from seven to 85 years of age. The opportunity to interact with eager Chinese singers was a highlight of the two weeks and always ended with a “photo op.” Two brilliant young Chinese musicians who study in the United States, Wenhao Mu and Wenjing She were invaluable to these sessions and the lectures Allen and Karen gave. Allen spoke about Healthy Voices – Health Choirs. Karen spoke about The Evolving Singing Voice: Moving Toward the Senior Years. “Straw phonation” was a “hit” with hundreds and hundreds of singers from around the world. We should have brought many more straws! The cultural variety of vocal sounds, languages, traditional costumes, scale patterns, rhythms, and performance presentation was eye-opening. It is rare that one is immersed in such a limitless palate of age-old vocal and musical traditions from around the globe. Leadership of IFCM is to be commended for their global perspective and initiative sharing the riches of all choral music has to offer our world. Emily Kuo Vong, President, Michael Anderson, former president, Phillip Brunelle, former vice president, Tim Sharp, ACDA Executive Director and NATS member, Francesco Leonardi, and Andrea Angelini are an inspiration. They made sure everyone had a great musical and cultural experience in China. The opportunity for NATS to be represented in what IFCM is doing around the world was an honor. New friend and fellow lecturer, Sylvie Le Bomin added an ever-present sense of exploration. She is a renowned ethnomusicologist who spends half the year in France and the other half in Gabon, in central Africa. She has researched the principles of meter, rhythm, melodies and context for the oral tradition of singing pygmie’s language.